Hope you’ve enjoyed this three-part series of my favorite things! They truly are my favorite things and I truly do buy all of my Christmas presents here because there are so many talented artists and makers. Enjoy, and thank you for supporting and shopping local! A must have every year is a dish scrubby. 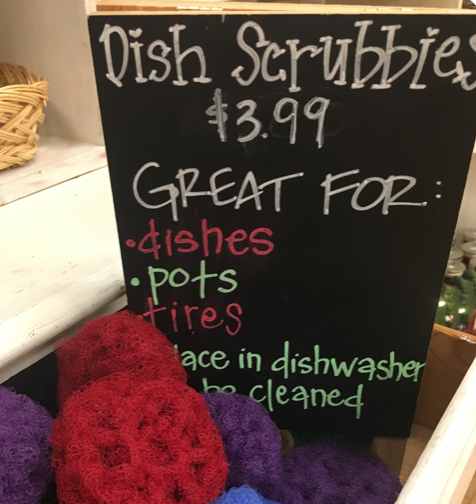 Locally made in Lakeville, these are by far the best dish scrubbers in the universe! So simple yet so effective! I dislike winter and I dislike cold even more—these fingerless mittens made locally in St. Paul hand-crocheted are the absolutely the most fabulous things in the world. They keep your hands warm but your fingers mobile. No more dry hands with these covering you up!!!! This artist’s work absolutely always astounds me! I love everything he does and have a small collection of my own going over the past several years. 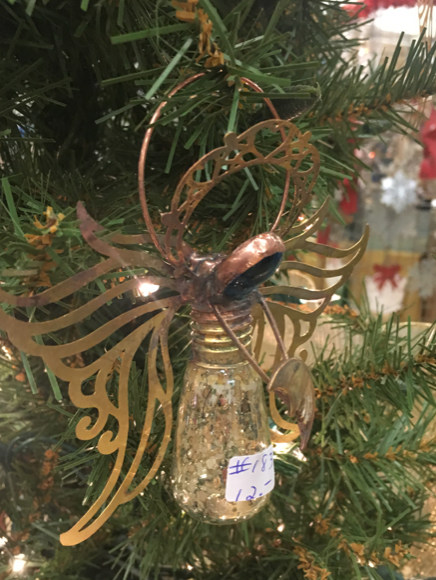 I love these angel ornaments that are all one of a kind for $12! Perfect for any gift exchange, ornament exchange, secret Santa, hostess gift. These are simply unique! This Minneapolis-based artist is the most fabulous metal outdoor art. Always a customer favorite! I particularly love her birdfeeders and squirrel feeders. I promised myself this year I am going to get one! One of my absolute favorites is the granite cheese board/tray. Each one is individual and unique and handmade in Elko. Place it in your freezer, keep it outside in the winter and pull it out for entertaining put cheese, grapes, cheese ball, jams, spreads, even a bottle of wine to keep it chilled. And so affordable! 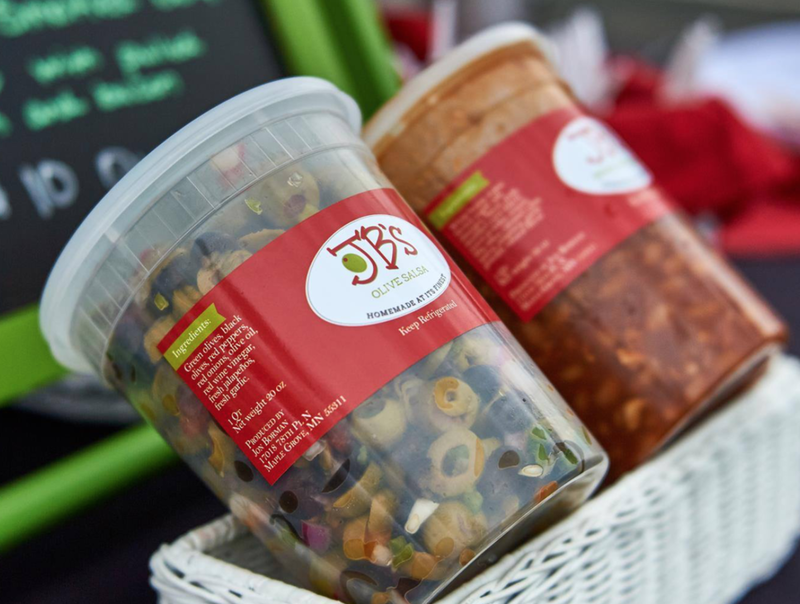 Let’s talk food… JB’s olive salsa is so versatile for pizza, scrambled eggs, sandwiches, spaghetti sauce, tacos, or just as a dip! A bestseller every year! And my oh my, Natasha’s pierogies are simply the best comfort food around! You must come in while she is personally sampling so you can hear her delightful Russian accent! Try the sauerkraut, the garlic ginger sauce, anything she makes. My personal favorite is the mushroom sauce. To die for! New this year is Sara‘s tipsy pies! Yum Yum! Another great comfort food. My favorite is the bierfest that has sausage, beer and sauerkraut all wrapped up in a yummy delicious pie crust. Who knew you could carb load at the Holly House?! Raise your hand if you like making dinner every. Single. Night. Not me! That’s why I turn to these Frontier soups at least a couple times a month. Gluten free, low sodium, all natural. And they fill a crockpot and are hearty and delicious! Stock up on these at $7.95 each. Yummy!!! Kim's Favorite Things Part 2! 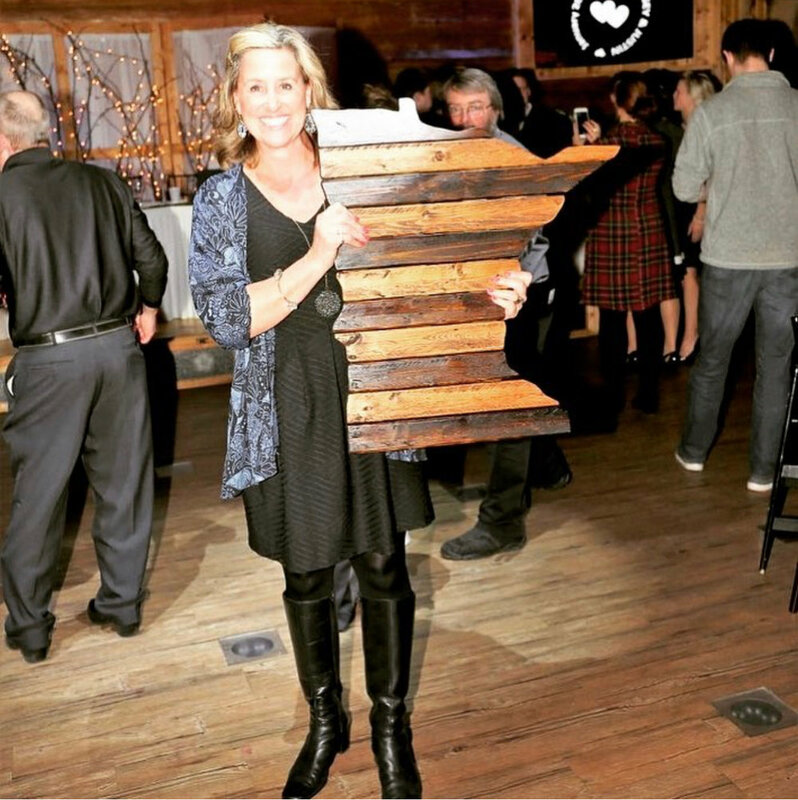 Here is the second part of our owner Kim’s very favorite things! Tea tree oil is also a must for me! I use it all the time on my lips—I usually have one in my car, one in my purse & one in my makeup drawer. Great for dry skin and spectacular for winter chapped lips! A must have! With so many local taprooms in and around the Cities, we are so lucky to be able to experience so many different beers. I bought my son this “drink local” t-shirt last year and he loves it. He goes to college in New York so he is proudly representing our wonderful craft beer businesses in Minnesota. Everyone loves food as a gift! How about this awesome maple syrup from Jordan? It is also a blue ribbon Minnesota State fair first place award winner. 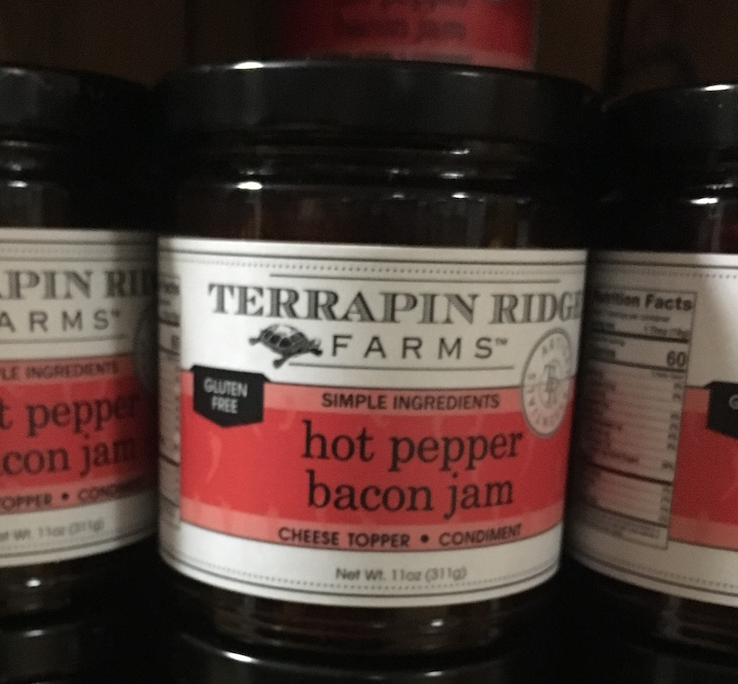 Another great food item—hot pepper bacon jam—such a unique taste for your holiday parties or for a hostess git. Need a one-of-a-kind stunning piece of holiday art above your mantle? In your entryway? All of these are one-of-a-kind made locally in Prior Lake. Stunning, beautiful, elegant, a true statement piece! This is a great gift for yourself! Every year I tell myself I’m going to get one of these and I think this is finally the year. I love these felt wreaths made locally in Lakeville. Made out of old wool sweaters. So crafty, so clever. A great piece for your home inside or outside. I bought my daughter one of these for her apartment—it is absolutely darling! Raise your hand if you don’t like spending six dollars on the card!? Who can resist these dollar cards? I always stock up on these and have a stash ready to go, which saves me so much time and money. Each one is handcrafted in Eagan. These are just a few of the HUNDREDS of amazing things we have in the store. Starting Thursday the 13th, for the first time ever we are open for 10 days in a row! As the holidays draw closer, we are ready to help you get your entire list taken care of in one spot. We can’t wait to see you soon! Kim's Favorite Things Part 1! As the owner of the Holly House Boutique, OF COURSE I do all my Christmas shopping in my own store! With almost 70 different artists, bakers and makers, I have so many choices—but I would love to share with you a few of my favorite things! Twisted Organics is one of my very favorite lines! I use the whipped body butter every night on my face. I go to bed with an oily face and wake up with fresh, smooth skin. The general cleaner is also one of my favorites along with the fresh linen spray which I use at my house as a room freshener. The bird seed feeders are probably one of the best gifts you could give to anybody. Need a gift for that hard to buy for person? You need a gift for a hostess? Need a gift for someone who has everything? This is perfect! Under $25, squirrels never touch it and birds love it! Made locally in Waconia. This is a perennial best seller. I never get over the creativity of our metal artist Brenda. Her stamped silverware is amazing a great price point and outstandingly unique! Again a perfect gift for a hostess, a neighbor, a friend, secret Santa! These oil cloth bags are a favorite of mine as well as a favorite gift to give. Who doesn’t need a big bag to travel with? So cute, such unique prints, and locally made in Alexandria. Great for any age! Need a gift for the wine connoisseur or just for someone who loves their wine? Anything made by this artist is always so stunning! Everything is made out of wine barrels, and most importantly—each and every one is one-of-a-kind—you will not find these at Target! This raspberry amaretto is a must-have to keep on hand for entertaining. Great over cream cheese, great over ice cream, perfect on pork in the crockpot. Yummy and delicious! We love the way wood and metal goes together on anything this local artist does. Plaid, magnets, barnwood, birch… these were a best seller at the state fair! These are great gifts for anyone who is from Minnesota or lives in Minnesota. Another great gift for a beer connoisseur are these great beer stones by Brewmuse from St. Paul. Want to enhance the aroma flavor and appearance of your beer? Drop two of the stones and your beer to keep it flavorful and strong. Need a new holiday outfit? So do I! I always find myself at least one or two items to wear during the holidays from Mainstream Boutique. We are lucky because they also bring exclusive items just for Holly House customers every year! Look super stylish at all your holiday events. And how about what to get a guy, any guy for Christmas? Let’s be honest, this is a toughie! We have you covered at the Holly House! Try out these men’s boxer shorts that say “skol” on the front and back. Also, we have boxers for the beer lover, the golf lover, the fisherman, the patriot and the lake lover. CHECK BACK FOR MORE FAVORITE THINGS! Lefse Learn About the "Norwegian Tortilla!" We should probably cut down on the Lefse puns, but we are just so excited to feature our friends from Thor’s Lefse as you start to make Thanksgiving plans for delicious treats. 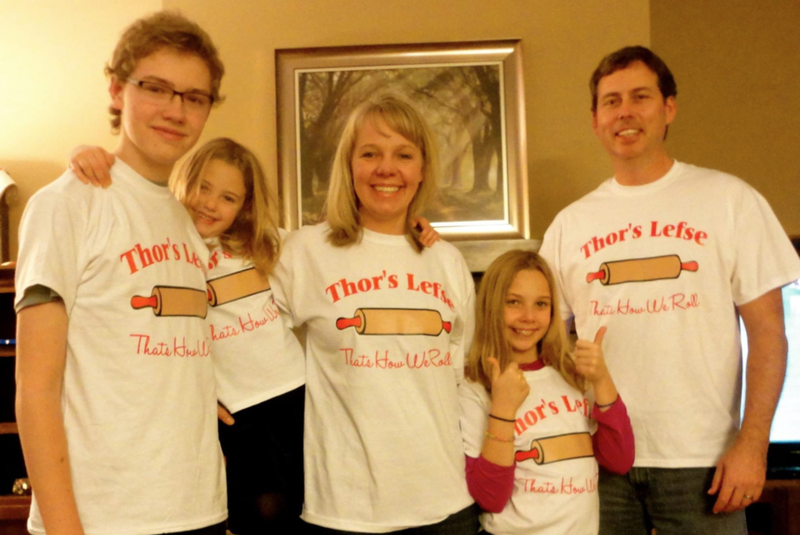 Thor’s Lefse is owned by Thor & Becky Erickson of New Prague. Thor started making lefse 8 years after his Grandpa Ed (the original family lefse maker) passed away. They noticed that something was missing from holiday dinners. It was the homemade lefse. In fact, Thor still uses the lefse grill his grandparents used over 40 years ago to make the product you see in The Holly House Boutique! Thor’s Grandma and Grandpa Erickson are the inspiration behind the business. It’s a common bond between the past and present that much of his family uses to recall fond memories of holidays past. One of the favorite things about their business is the memories that many people have relating to lefse. Memories of loved ones. Memories of making it in the kitchen with family. Memories that connect people to a happy time in their life. It’s fun to hear customers in the boutique talking about the memories and connections that people have relating to lefse. If you aren’t familiar with lefse, it’s delicious and we invite you to try it! It can be served with butter, cinnamon sugar, brown sugar, or lingonberry jelly before being rolled, to be eaten in a similar fashion to a crêpe. One may also choose eggs, sausage, and cheese to make it into a breakfast burrito. There is no wrong way to eat lefse! Thor’s Lefse can be refrigerated for 7 days, which makes today and tomorrow the perfect time to get some for your Thanksgiving! Kim and Jeff Schueller welcome you to The Holly House Boutique! I wanted to tell you a little bit more about how my passion, the Holly House Boutique—and why I think it’s so important to support local Minnesota Makers and their small businesses. I was a maker for 16 years. I had my own line of hand painted pottery, and I traveled around Minnesota and Chicago doing art fairs, craft shows and various boutiques. One of the boutiques where I sold my pottery was the Holly House Boutique. I was a participant at the boutique for about five or six years. The original owner approached me and told me she was thinking of selling the boutique, and would I be interested in purchasing it. I flat out said “no thank you!” But, despite that reaction, we decided to meet in February and talk about it, discuss it and go over some facts and numbers. It was very apparent to me that art fairs were becoming more difficult, not as profitable, and oversaturated. I knew we needed a different path for Makers to show their art and find customers. After thinking about it, discussing it more, I decided to make the leap and purchased the boutique. I had a lot of contacts in the art fair community and came out it from the perspective of being a maker it was a natural transition for me. I purchased the boutique five years ago, and it was the best decision! The original boutique started in a home, moved to model homes and golf courses and other places around the South Metro. It was my goal when I took it over to take it to the next level and really make it into a business. The original boutique was three weeks long—now, The Holly House has grown substantially into an eight week season, and for the first time we are in the in a mall setting. In addition, we are now in our fourth year at the Minnesota State fair. We are able to see more customers now than ever before—this year has already been so successful, and we are looking forward to the next few weeks! My favorite part of my job is marketing, meeting all of the makers, finding new makers, and meeting customers. I love seeing people walk out of the boutique with unique finds for themselves and their loved ones. My number one goal is to always keep the boutique fresh and new and relevant! In my spare time I like to be outside at the lake, work out, and spend time with my husband Jeff and my two kids, Alex and Jake. I am very fortunate to be able to do this for my job and love every single day! Thank you for supporting us, and come up and introduce yourself when you see me in the store! Welcome to 2018 Holly House Boutique! We are unbelievably thrilled that the Holly House 2018 grand opening is only TWO weeks away. On November 1, we will be ready to greet you for the holiday season with hundreds of unique gifts (for others or yourself!) that you won’t find anywhere else. Just like Santa’s elves, we work behind the scenes all year to make sure the boutique features the best that our Minnesota Maker creative community has to offer. 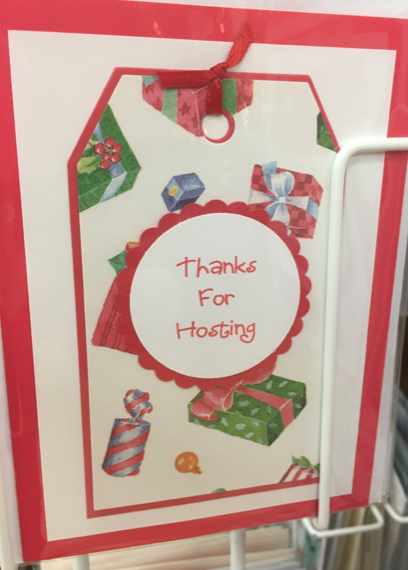 Over the past few years, we have grown every single holiday season thanks to our amazing customers. This year, we are excited to announce we have 63 Minnesota Makers—gifted artisans, craftsmen and bakers—in a huge 7,000 square foot space in Burnsville Center. This means that you will have even more options than ever to cross off every name on your gift list in one stop. Over the next two weeks, we will be introducing you to 2018’s Minnesota Makers, the products you can purchase at the Boutique this season, and a calendar for special events over the Holly House season. Until then—keep checking your mailbox for our signature mailer, and mark your calendars for November 1 for our seasonal grand opening! We can’t wait to see you soon and introduce you to the 2018 Holly House Boutique.